Monster Tennis program provides four distinctive age appropriate program for children aged 3 to 10 years old. Each program utilizes different size racket, difference bounce tennis balls, and even different court dimension to ensure each children will progress according to their age and ability. 1st hour Trial Lesson is FREE, please contact us to arrange. Please choose from one of our 4 age specific program to enroll your children in the "Course Location" section. The Rules of Tennis have changed ! Its OUT with the fast Yellow Ball and IN with the slower Red, Orange and Green balls. 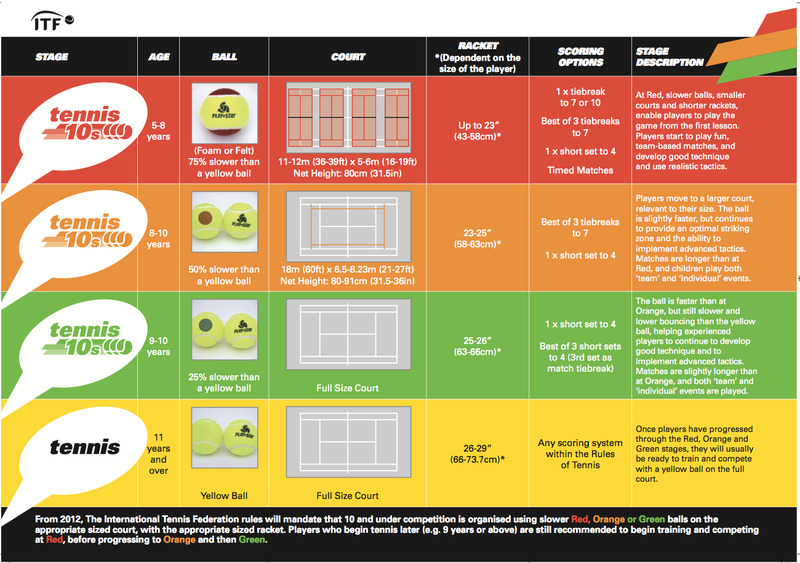 The new rule for 10-and-Under tennis competition is in effect from January 2012. **Our 3 - 5 years old children will use the Foam or Felt ball in our program. For more information about the Tennis 10 initiative, please visit www.tennisplayandstay.com for details.